The Leading Reasons for a Bad Wrap! Nobody likes failing! It just looks bad. If you own a business, it can be the difference between repeat customers, tons of referrals, or closing up shop. When it comes to the installation of vehicle wraps, there are four main reasons why vehicle wrap vinyl materials fail. We should know. We've been there, done that. We've made costly mistakes, but have learned to fix them. We're always continuing to learn. The key to any failure is learning from your mistakes, taking care of the customers, applying what you've learned, and continuing to work towards perfection; always maintaining high standards. When it comes to the installation of vehicle wraps, all vinyl wrap material is not created equal. There are several levels of quality, and different vinyl’s for different applications. Choosing the wrong film can result in poor adhesion to the vehicle surface, bubbling of vinyl, severe wrinkles of the film, and over stretching of the vinyl distorting the graphics and the color. The companies that produce the best films on the market offer vinyls for wrapping of varying qualities for the job being done. It is very important that the correct film is chosen for your vehicle. Preparing a vehicle for wrapping is not just taking it through the car wash. All dirt and oil must be removed from the vehicles surface to ensure a proper bond of the vinyl's adhesive. Any dirt or dust will show through the graphic installation; even the smallest of dirt particles and dust. Any oil or silicon residue can lead to poor adhesion and bubbling of the wrap material. Proper installation will include your installer using chemicals and cleaning techniques that ensure every nook and cranny of the surface being wrapped is prepared correctly for the installation. Where the installation is done is important as well. An indoor environmentally controlled and dust free space is the best possible place for ensuring a good installation. The best vehicle wrap films are expensive due to the R&D in the characteristics of the film. When producing and printing vehicle wraps, there is a balance of having just enough material or too much material. Having too much material is wasteful and costly, but worse, having too little can result in having to overstretch a vehicle wrap material beyond its physical properties when installing. 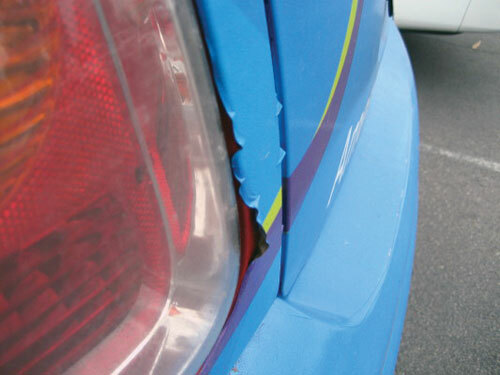 Over-stretching can be observed by a whitening of the wrap vinyl. This is typically found on challenge areas such as vehicle bumpers and compound curves, or the deep inset panels on some vehicles like the sprinter van models of a number of manufacturers. Vehicle wrap vinyl is a form of PVC. One property of PVC is that it has a memory to conform back to its original shape. While that can work in favor of a wrap installation, there are problem areas that need to be addressed with post application heating or potential failure may occur. This failure includes the lifting of material from the vehicle surface at an edge or in deeply recessed channels. Post heating of the vinyl in these areas to specific temperatures will cause the material to lose its original memory and set the adhesive layer to stay in place. There are of course other potential reasons for vehicle wrap application failure. The key to choosing a vehicle wrapping company is one that understands why materials fail, hold high standards of production and installation, will take the extra time necessary to ensure a great application, and will be there for the customer when problems occur. Always ask and verify that your wrap is being done by a certified installer trained in the best industry application practices to ensure a good and long lasting wrap. Idea Printing & Graphics warranties it’s installations for one year from date of wrap completion. If any issue arises bring it in and we will fix it.